The security breaches at Sony and RSA received a tremendous amount of media coverage – and rightly so, given their impact on those organizations. However, there are hundreds of security events occurring every day that don’t make the news and are just as, if not more, dangerous. 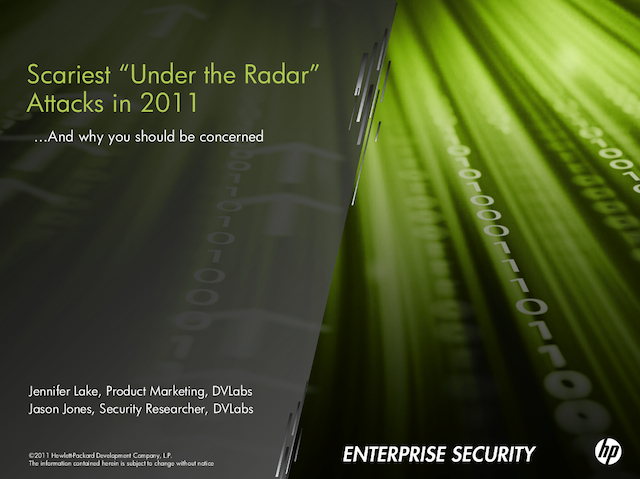 In this webinar, HP’s DVLabs will present the top five attacks it has seen that slipped by traditional media. The security incidents discussed during this presentation demonstrate new techniques that attackers are using as well as why these are significant to the enterprise. The intention of this webinar is to use these attacks as examples for helping attendees better identify where they are vulnerable so they can be prepared to address these vulnerabilities before they can be exploited.